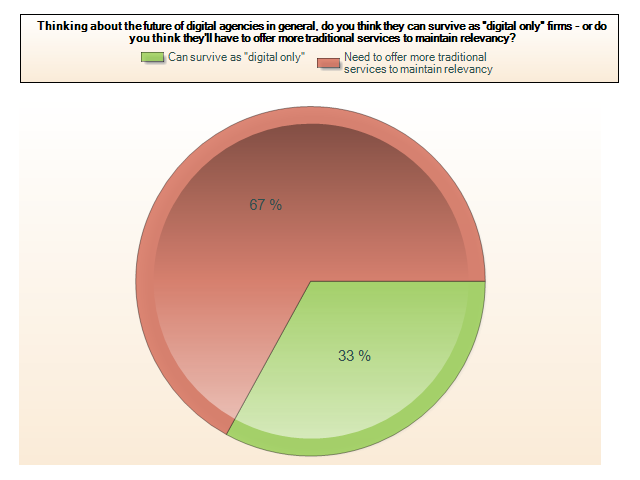 Is “Digital Only” Still at Risk? During the heat of the recession in 2009, Marketers were blindly jumping on board the digital train without a lot of consideration for strategy, return on investment, or integration of the platform into other marketing efforts. In 2011 we asked a very pointed question of Marketers in one of our surveys we issue annually. The results created quite the stir among digital shops. 67% of Marketers stated that “Digital Only” shops would not survive if they remained as digital only shops. If you have a couple of minutes, we are looking to see how or if your opinions have changed about digital firms. We would welcome your perspective on this and a handful of other issues related to agencies.